Only the well-drilled 1st Virginia Regiment beat us -- and they had guns! See the Honors list. Once again we had a a tremendous turn-out of marchers, both 2-legged and 4-legged, on a lovely day for a walk through Old Town. This year, GTMS, the world's only marching tavern museum group, also included a red convertible -- a proper 21st century conveyance for Mr. Gadsby and friend. See the pictures and links to more. GTMS had its largest marching team ever for the 2011 Scottish Walk on December 3rd to kick-off Alexandria's Christmas Season. Our 20+ two-legged walkers enjoyed perfect marching weather. We were accompanied by several four-legged marchers, including Posey, this year's Tavern Dog, a Tavern Dog alumnus, and a couple of puppies enjoyed the day, too. See a Slideshow of great parade pictures from GTMS Member Joey Wang or some snaps from among the marchers. 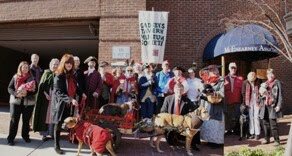 Accompanied by the 2009 Tavern Dog, Daisy, and a miniature George Washington, several hardy GTMS members and friends faced the snow, rain, and cold of the annual Scottish Walk. You, too, can join the world's only Marching Tavern Museum! 185 years ago Congress asked President Monroe to invite the Marquis de Lafayette to visit the still very young United States. Arriving in New York on August 15,1824 he spent the next 14 months visiting all 24 states and every major city in the Union. At each stop he was enthusiastically applauded, feted, thanked, and celebrated at all manner of ceremonies, balls, parades, and parties. GTMS held another party for him -- a little late. The appropriately French fete provided the venue for a very successful Silent Auction. Proceeds went to support the Ice Well Campaign.